WASHINGTON — As the Air Force leaves 2018 behind and flies into into a new year, the service may face some big changes to its organization and aircraft inventory. Expect to see a lot of these questions answered with the release of the fiscal year 2020 budget, which officials have said will be released in early February. Neither outgoing Defense Secretary Jim Mattis nor its acting head Patrick Shanahan has confirmed a topline budget for the department — the latest reports peg it at $750 billion, up from the $733 billion the Pentagon originally planned for and the $700 billion that President Donald Trump mandated afterward. However, much of this could be dependent on whether the Air Force sees a funding bump this year. What’s going on with that F-15X buy? Rumors have swirled for more than a year about whether the Air Force could buy additional F-15s, but it appears that the service will begin purchasing more of Boeing’s air superiority jet. On Dec. 21, Bloomberg reported that the Air Force will request 12 F-15Xs for about $1.2 billion as part of the FY20 budget request. The F-15X will be a new variant of the F-15 that includes a new electronic warfare suite, radar, cockpit and the ability to carry more missiles. 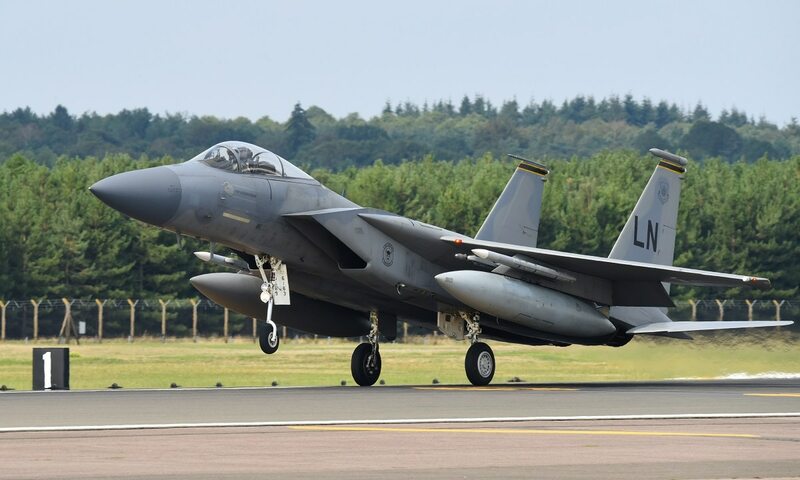 Bloomberg reports that the decision to buy the new aircraft stems from top Pentagon leaders who want new F-15s to replace the aging models used by the Air National Guard — and pointedly not the Air Force, which has been resistant to buying new, fourth-generation planes. In September, when asked whether the service was considering the purchase of the F-15X, Air Force Secretary Heather Wilson said the service needed to use its purchasing power to buy more fifth-generation fighter jets like the F-35. The Air Force's top leader says the service isn't interested in the F-15X or a F-22/F-35 hybrid. But could those aircraft still have a chance? One thing to keep an eye on is how Wilson and her uniformed counterpart, Air Force Chief of Staff Gen. Dave Goldfein, justify the purchase of new F-15s, and how they characterize their own levels of support for the initiative. A lack of enthusiasm could be seen as damning on Capitol Hill. The other big questions: Will the number for FY20 hold if there is more budget fluctuation following Mattis’ departure? And what does the Air Force’s five-year plan look like? That could provide a hint on just how big this investment ultimately may get. Does the Air Force buy light attack aircraft? The Air Force was supposed to put out a final request for proposals this year for new light attack aircraft. That has officially been pushed back until 2019, leaving two competitors in a state of purgatory. Those wondering if the Air Force will start a new program of record will have to wait a little longer. If the service moves forward with a competition, it will come down to Textron’s AT-6 and the A-29 Super Tucano made by Embraer and Sierra Nevada Corp. But industry sources are still unsure whether the Air Force will commit to a formal program of record. Another major question is just how big the program will be. If fewer than 100 planes are purchased, those will likely be deployed exclusively by Air Force Special Operations Command for low-intensity combat, Maj. Gen. Scott Pleus, Air Combat Command’s director of plans, programs, and requirements, told Air Force Magazine. A larger buy of hundreds of aircraft would allow the Air Force to spread its light attack planes more widely, through the United States, Europe and the Asia-Pacific. How do Air Force space operations change with the addition of a Space Force? The Pentagon’s latest draft proposal would funnel the new military branch for space operations under the Department of the Air Force, a decision that would give the Air Force a continued voice on national security space pursuits. The new service will be overseen by the newly created undersecretary of the Air Force for the Space Force and a Space Force chief of staff, who will sit on the Joint Chiefs. The service would be led by a Space Force chief of staff and an undersecretary of the Air Force for the Space Force, who would report to the Air Force secretary. This seemingly gives the service’s top civilian a considerable amount of authority over the Space Force. Still yet to be seen is whether that solution will satisfy Congress. Rep. Adam Smith, the incoming head of the House Armed Services Committee, remains skeptical about the need for a separate military branch for space, but other lawmakers may be more bullish about the Space Force’s need to remain separate from the Air Force. Another big question is what this means for the military’s current space organization. Does Air Force Space Command and the Space and Missile Systems Center transfer over to the Space Force? Do the Navy and Army keep their own portions of the military space enterprise? And who is going to get named as the undersecretary of the Air Force for the Space Force, anyway? Will there be some restructuring of Air Force headquarters at the Pentagon? Earlier this month, Heidi Grant, the outgoing deputy secretary of the Air Force for international affairs, confirmed that the service is considering transferring some of her office’s strategy development functions to the Air Staff’s office for plans and requirements, also known as the A5. Rumors of the SAF/IA shop's demise may have been overstated, but changes could be coming soon. This, she said, was part of a larger reorganization currently being considered by service leadership. These internal decisions reportedly aren’t tied to the budget, and Grant said the Air Force could come out with a decision as early as January. However, leaders have said little about what sort of changes have been proposed. Is this just the transfer of some responsibilities from one office to another, or might we see some consolidation or the creation of new offices as a result of the deliberations?